When the industry mastermind Sundari from The Wedding Stylist approached me to work on a Home Creations shoot I was instantly captivated. 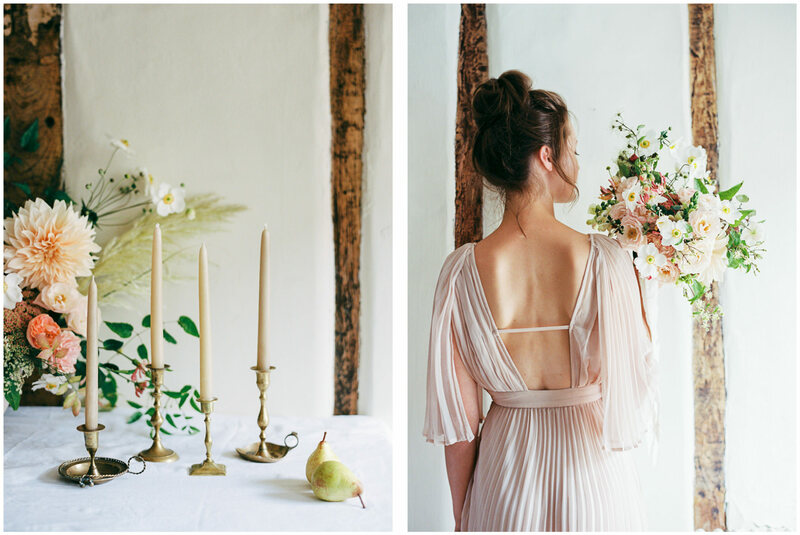 This was a truly organic experience – just myself, The Wedding Stylist, Sundari and the wonderful Charlotte from Verity & Thyme. Hosted in Sundari’s beautiful home, the space alone was inspiring, these two ladies brought so much more to the experience too. It really was a dream day. 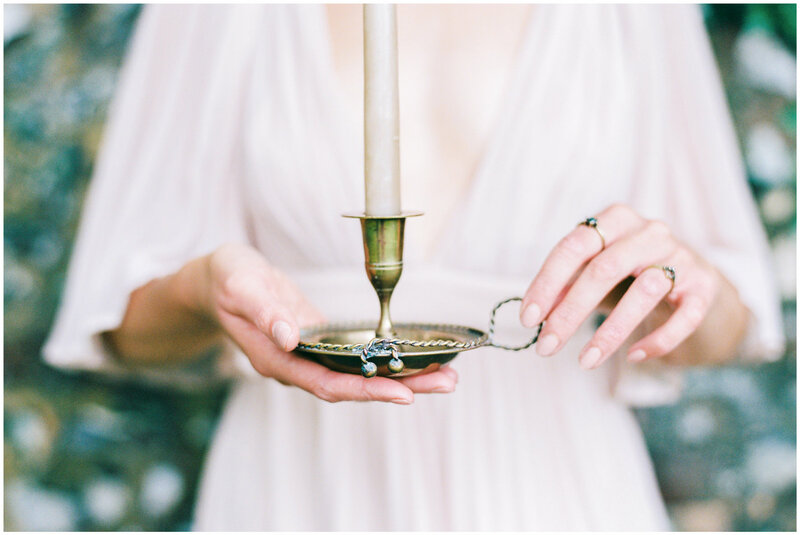 So often I’m guilty of creating beautiful shoots with around 18-20 suppliers. Granted, not everyone is present on the day, but it is a huge team effort and a big job! How refreshing to strip it back and just have the three of us. Natrually it does help when the super talented florist is also a mega babe and part time model. Surrounded with inspiring chat, great coffee and local food, we really did feed our souls. 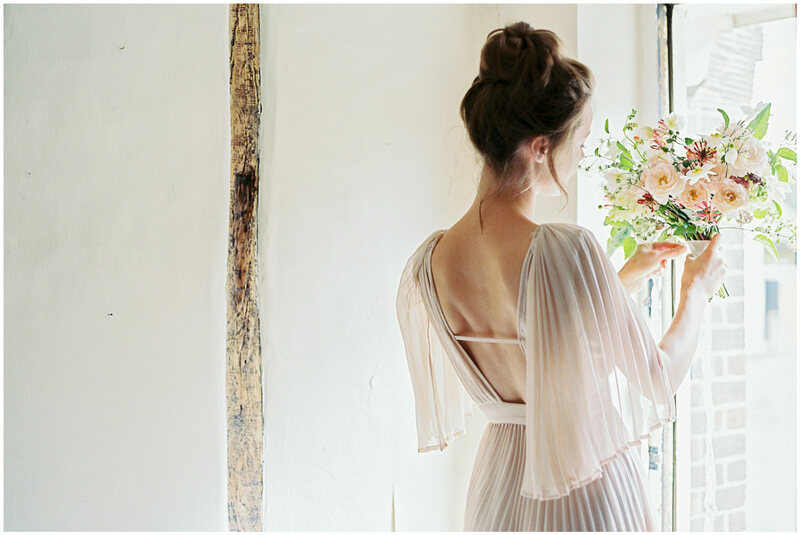 “Using the local English countryside and an ancient village in the heart of Buckinghamshire allowed for us to create a soft and atmospheric enveloped creation. The backdrop for our story takes place in the home of our muse. 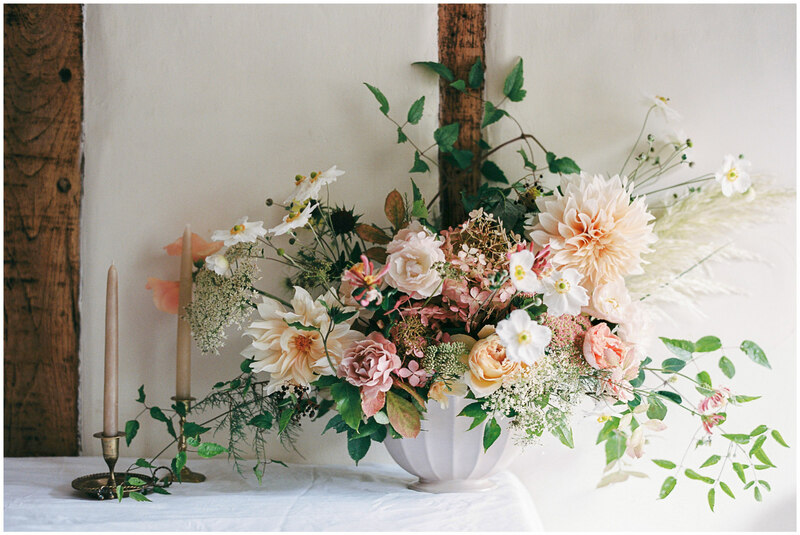 A florist in her 17th century cottage in a small village called Old Amersham. She cultivates her creative energy from her own dwelling with its ancient beams and the secret pockets of her village as she wanders. The warm late summer breeze captivates her as she gathers and forages seasonal florals and foliages from her garden. 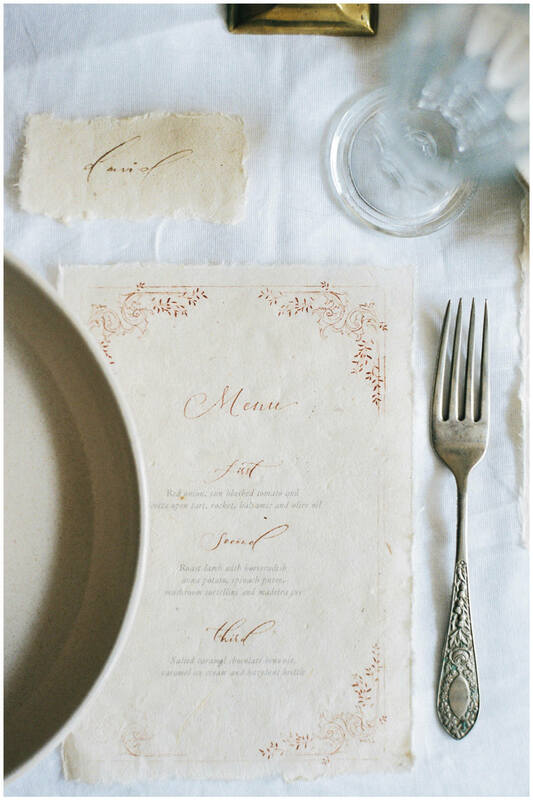 She sets the table for an intimate evening with those she loves. The Buckinghamshire countryside offers up some of the most beautiful, English grown bounty to select from. 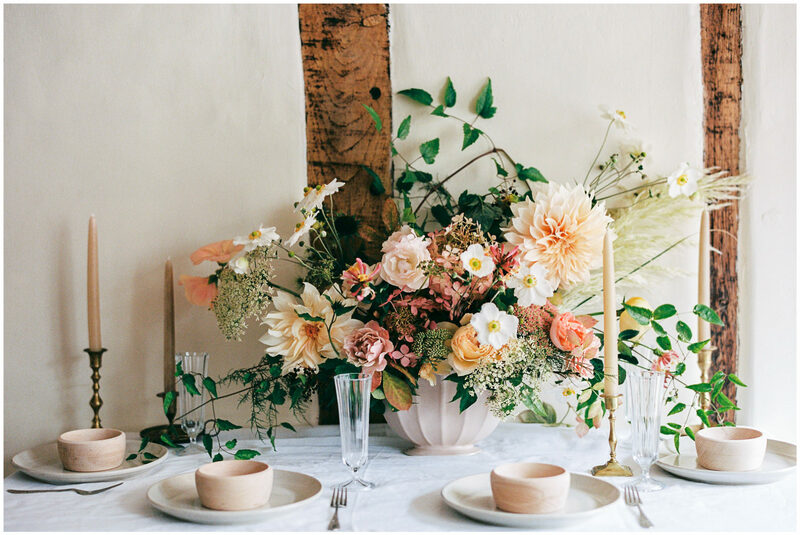 Our muse values growing her own local flowers as much as she can during the seasons. 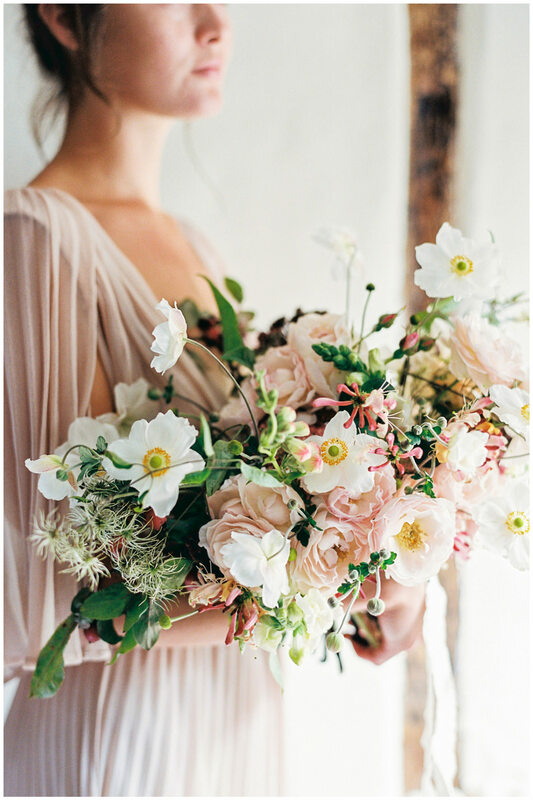 She has a particular love for when summer leans towards Autumn offering up incredible depth in tone and texture that allows her to create rich, whimsical florals. She carefully picks fruit from local orchards and celebrates the derelict and crumbling architecture speckled across her village. Her home built over 300 years ago, stands the test of time much as her floral passion, which has been passed down from generation to generation. This is something she is deeply connected to when she arranges flowers. She even collects flowers growing in both her Mothers and Grandmother’s Buckinhgamshire gardens. 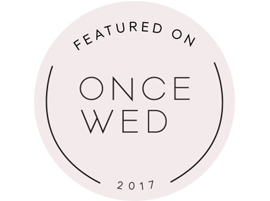 Once Wed have featured this breathtaking Home Creations on their blog and I am so proud! A business first and bucket list goal ticked off, what a dream! 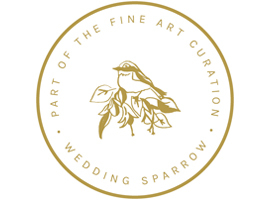 Wedding Sparrow have also published this Home Creations shoot on their blog. Share this with a 2018 bride to inspire her! 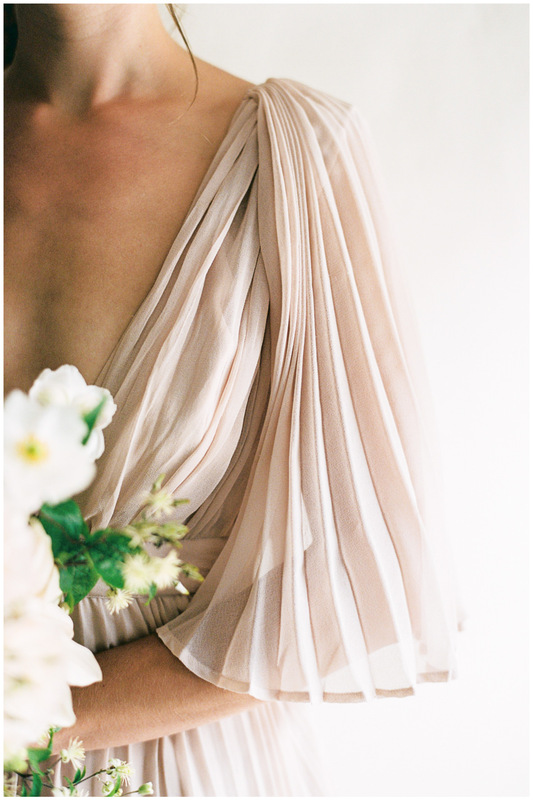 If you were inspired by this non-bridal gown, head over to my post about bridal separates for more inspiration.